Sputnik correspondents managed to explore makeshift factories in eastern Aleppo used by terrorists to build bombs laced with poisonous chemicals. A source in the Syrian military confirmed that this type of ordnance was used by the terrorists against the Syrian army; one such attack occurred in the southwestern area of the city in the vicinity of the al-Assad Military Academy. Analyses indicate that chemicals used by the terrorists were made in the US while the bombs were manufactured on site. 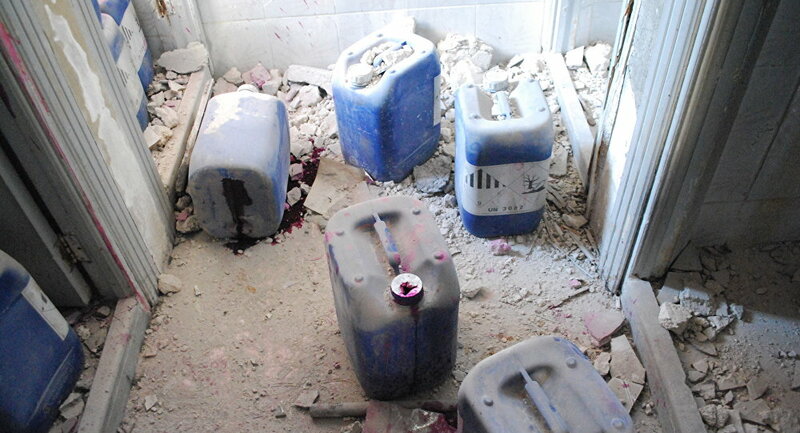 Furthermore, the mark UN 3082 is clearly visible on the chemical canisters discovered at the terrorist factory. Earlier this year Samer Abbas, spokesman for the Syrian National Authority monitoring the implementation of the Chemical Weapons Convention, contacted the Organization for the Prohibition of Chemical Weapons (OPCW) and presented documented proof of terrorists using sulfur mustard ordnance against civilians in Syria. OCPW declared that a special committee to confirm the veracity of these documents needs to be created, but so far have apparently refrained from pursuing this line of inquiry for reasons unknown. Meanwhile, Russian Defense Ministry experts collected evidence of terrorists using chemical weapons in Marana Um Hosh village located to the south of Aleppo.